follow us on our adventure around the world! we're getting ready to head out on our big adventure! we're headed to los angeles, hollywood, australia, new zealand, narnia, middle earth, and the cook islands! there will be baseball, whale watching, bungy jumping, snorkeling, scuba diving, white water rafting, kayaking, scrapbooking, and whatever else we find to get into! we should be online most of the time, so we hope to post photos and stories. yes, it's a work trip, so i'll be working hard at two laptop crops. yes, scrapping with my downunder scrapbooking pals all day. hey, it's a tough job, but someone has to do it!!! but then we'll fit a little, okay, well a lot of vacation in before we head home. it's great to have friends in exotic places!!!!! monday will be los angeles, hollywood, and a dodgers game (of course i'm wearing my cincinnati reds shirt!!) we figured since we had to fly via california, we might as well pick up another baseball game. allen has only 4 stadiums left to see of the 30 MLB stadiums! can't wait to see chris and tara again! here are our stops, can't wait to see many of you along the way!!!!!!! I will make sure you work hard but play harder!!!!! Can't wait to meet you!! 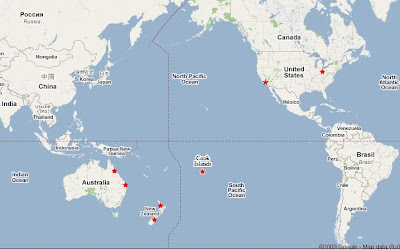 this is super cool Margie love your maps you have on your blog. soooo exciting!!! I can't wait to follow along!